Amatrol’s Servo Robot Station for Table Top Mechatronics (87-TMS4) provides robot integration for Table Top Mechatronics with the Pegasus servo robot mounted on a traverse. Fully supported by Amatrol’s curriculum, learners will practice robot programming and robot interfacing to Amatrol’s portable mechatronics system to create applications such as a robot-based inventory station. The ability to expand a tabletop mechatronics system to include a servo robot is unmatched in the industry. To update the Table Top Mechatronics System for operation with the Pegasus robot, this robot integration package includes three conveyor chute assemblies and a feeder assembly all equipped with sensors. These sensors are wired to the mechatronics system’s PLC to indicate when parts are present. Additionally, this system contains replacement foot supports, used to adjust system height, and other items required to interface the servo robot and servo traverse to Table Top Mechatronics. Robot Programming Training on a Table Top Mechatronics System! Amatrol’s Table Top Mechatronics Robot system proves that you can have all the features of a larger mechatronics system with the space-saving footprint of a table top system. Wired into the PLCs, the 40-inch long, servo-controlled linear traverse provides the robot with full access to the automated line. As parts are sorted by the mechatronics system and transferred to the appropriate conveyor chute, sensors read their presence and provide inputs to the system’s PLC. Based on these inputs and the learner’s programming, the PLC program will direct the robot to perform the desired request, such as returning specific parts to the parts feeder to keep the process running while ignoring rejected parts. 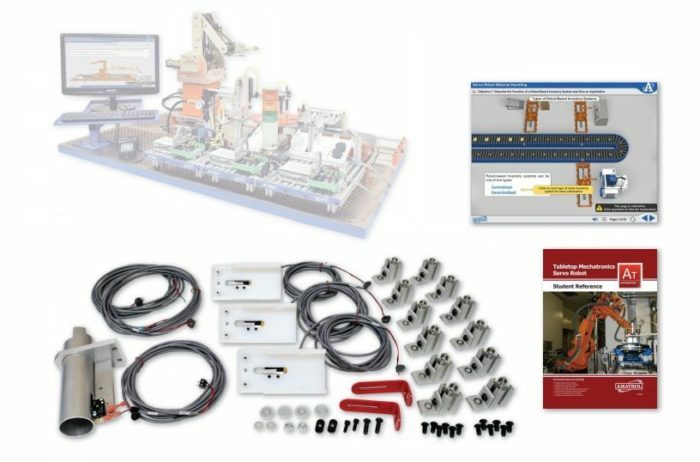 Amatrol’s interactive multimedia teaches learners mechatronics robot applications commonly used in real-world mechatronics systems, such as robot work envelope. In addition to teaching robot conditional commands such as If-Then, Else, Endif, and Inp, learners are taught how to create sequence flowcharts to help them visually organize their thoughts allowing them to select the best programming instructions for the task. Presented using animations, text, audio, and interactions that engage the learner and keep them focused on their work, this learning system’s curriculum seamlessly integrates with the Table Top Mechatronics curriculum to create an unmatchable learning experience. A sample copy of the Table Top Mechatronics Servo Robot Learning System’s Student Reference Guide is also included with the system for your evaluation. Student Reference Guides supplement this course by providing a condensed, inexpensive reference tool that learners will find invaluable once they finish their training making it the perfect course takeaway.